This isn’t just the most advanced E-Class yet. With technologies never before offered on a production car, the E-Class writes another chapter in the story of driving: Where cars can talk to each other, and look out for you, in ways you never imagined. You can’t see around corners. But your E-Class can. 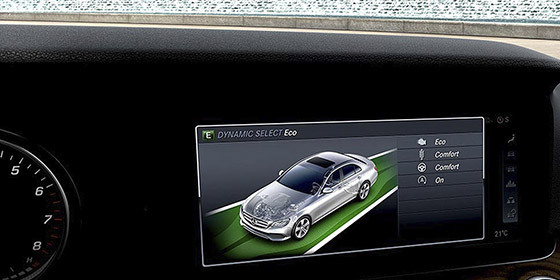 Groundbreaking “Car-to-X” technology connects your E-Class to a central information resource, to send you in-car updates about driving conditions before you get to them. Your car can also report hazards, to help other drivers with Car-to-X. It’s the first car that can cover your ears before a crash. Mercedes-Benz engineers are human engineers first. When PRE-SAFE Sound senses an impending collision, it emits safe “pink noise” via the audio system to pre-trigger your ears’ natural defense against the loud noises of an accident. It keeps its virtual eyes on the road, and the driver. 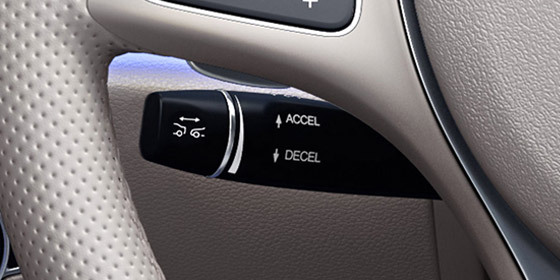 Standard E-Class safety systems keep a constant vigil. Radar-based Active Brake Assist helps mitigate forward collisions. Blind Spot Assist and a rearview camera watch your sides and behind you. And ATTENTION ASSIST can help sense a driver getting drowsy. In a side impact, it’s good to have innovation on your side. PRE-SAFE Impulse Side is an industry-first option that can help prepare you for an impending side impact. By rapidly inflating the front-seat bolster, it can move you further from an intrusion and help reduce impact forces. Sometimes the future is just one lane away. Available Active Distance Assist DISTRONIC takes cruise control in a new direction: sideways. It can stop and go with the flow. Help you stay between the lines, even in curves. And change lanes with just a touch of the turn-signal lever. 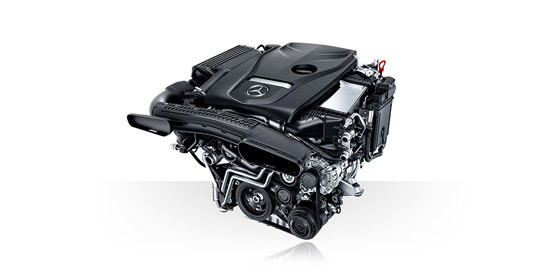 Athletically elegant outside, it’s in the E-Class cabin where your senses come alive. Vivid screens and flowing shapes entice the eyes. And from multitouch controls to aromatherapy and a hot stone massage, wherever you touch, it caresses you back. Standard COMAND navigation helps get you where you want to go with 3D maps and lane advice before turns. The touchpad controller lets you control by tapping, twisting or even handwriting. Apple CarPlay™ and Android Auto are standard, too. Two smartphone-like pads control nearly all the car’s features without taking a hand from the wheel. Swipe and select from the central screen with your right thumb. Change settings on the screen between the gauges with your left. 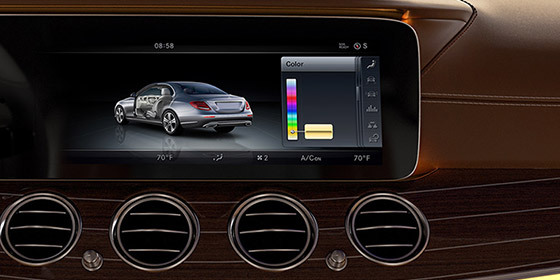 A panoramic 12.3-inch screen unites navigation, entertainment and countless comfort features. Sharp graphics and intuitive menus are clear to the eye and the mind. A second 12.3-inch graphical instrument cluster is optional. 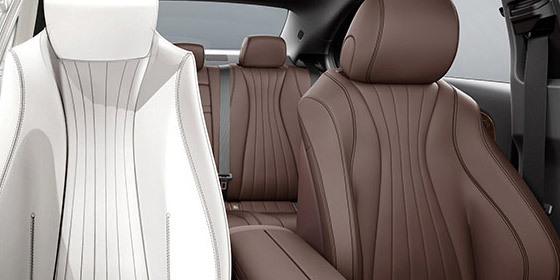 The E-Class cabin flows with the contours of nature. 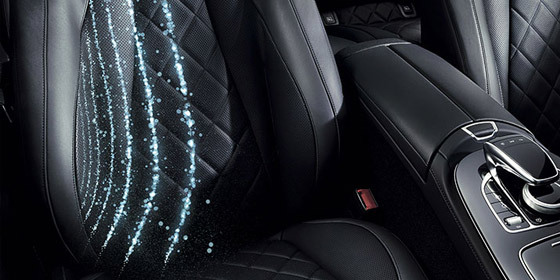 Finely tailored seats are sculpted to match the muscles in your body. Exotic yet sustainable woods sweep door-to-door, their natural glow edge-lit by 64-colour LED ambience. You don’t measure a car’s efficiency just at the gas pump. It’s also something you feel in its confident agility. How it moves into traffic, or negotiates a surprise. It’s how an E-Class always feels right for the times, and in the moment. An even keel, even on choppy seas. Available AIR BODY CONTROL turns pressurized air into poised handling and a polished ride. It’s self-leveling and adaptive, with modes for solo jaunts on twisty roads to Sunday journeys with the whole family aboard. Hugs the road, embraces the driver. While standard 4MATIC all-wheel drive grips the pavement, an E-Class holds its driver with equal enthusiasm. 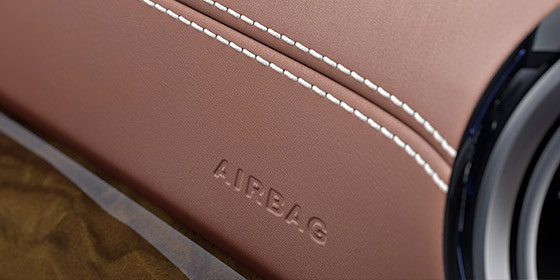 The enduring support of its ergonomically contoured and crafted seats can be further enhanced with active side bolsters. 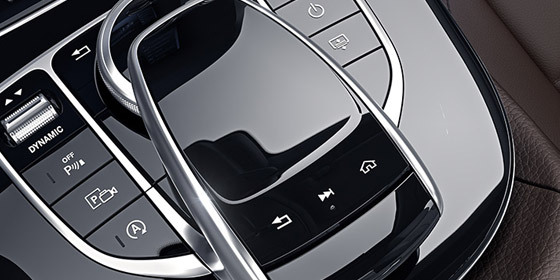 DYNAMIC SELECT dials in the car’s performance character with the tap of a console button. The throttle, shifting, chassis and more sharpen in Sport mode, ease up in ECO. There’s even a mode you can set up as you like. The turbo E 300 and biturbo E 450 squeeze more power from less fuel, atomizing and itemizing every drop, and self-tuning every few milliseconds. A paddle-shifted 9-speed transmission responds quickly yet relaxes efficiently. Car-to-X services are activated as part of Mercedes me connect. 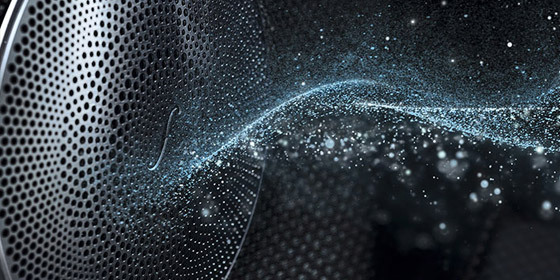 Connected services operate only where cellular and GPS satellite signals are available, which are provided by third parties and not within the control of Mercedes-Benz Canada. Audio/multimedia system must be turned on for system to operate. Some systems are optional. Even the most advanced safety systems may not be sufficient to avoid an accident. It is the driver’s responsibility at all times to be attentive to traffic and road conditions, and to provide the steering, braking and other driving inputs necessary to retain control of the vehicle. Drivers are cautioned not to wait for system alerts before braking or taking evasive action, as that may not afford sufficient time and distance. See Operator’s Manual for system operating speeds and additional information and warnings. System cannot prevent a collision, and does not alert the driver of an impending collision or system activation. PRE-SAFE Impulse Side not included if ordered with AMG Performance front seats. Active Lane Change Assist is not a substitute for active driving involvement. It estimates but does not predict the curvature and lane layout of the road ahead or the movement of vehicles ahead. It is the driver’s responsibility at all times to be attentive to traffic and road conditions, and to provide the driving inputs necessary to retain control of the vehicle. System may not detect some objects, obstacles or vehicles in the area into which the vehicle would move. See Operator’s Manual for system operating speeds and additional information and warnings. Active Distance Assist DISTRONIC is not a substitute for active driving involvement. It does not adapt cruising speed in response to stationary objects, nor does it predict the curvature and lane layout of the road ahead or the movement of vehicles ahead. It is the driver’s responsibility at all times to be attentive to traffic and road conditions, and to provide the steering, braking and other driving inputs necessary to retain control of the vehicle. Drivers are cautioned not to wait for the system’s alerts before braking, as that may not afford sufficient time and distance to brake safely. Braking effectiveness also depends on proper brake maintenance, and tire and road conditions. See Operator’s Manual for system operating speeds and additional information and warnings. While the navigation system provides directional assistance, the driver must remain focused on safe driving behaviour, including paying attention to traffic and street signs. The driver should utilize the system’s audio cues while driving and should only consult the map or visual displays once the vehicle has been stopped in a safe place. Maps do not cover all areas or all routes within an area. Apple CarPlay™ is a product of Apple Inc. Android Auto is a product of Google Inc. Device and app providers’ terms and privacy statements apply. Requires connected compatible device and data plan. Apps, content and features are selected solely by their providers. Connection to apps and streaming services may be limited by the device’s network connection. Data usage is routed through device and subject to fees, charges and restrictions in user’s wireless plan. Vehicle’s factory audio/information interface, including COMAND® navigation, may not be used simultaneously with Apple CarPlay or Android Auto. When Apple CarPlay or Android Auto is in use, the steering-wheel voice control button accesses Siri® or Google voice recognition software for voice commands.